In its pursuit for new materials for energy storage and conversion, the CSIR’s manganese (Mn) based battery cathode materials research is vital. The conversion interest is through the platinum group metals (PGM) and platinum free fuel cell catalysis work, while experiments in hydrogen storage are being conducted in the metal organic frameworks (MOFs) and high pressure (HP) composite cylinders. The research targets both stationary and mobile applications. 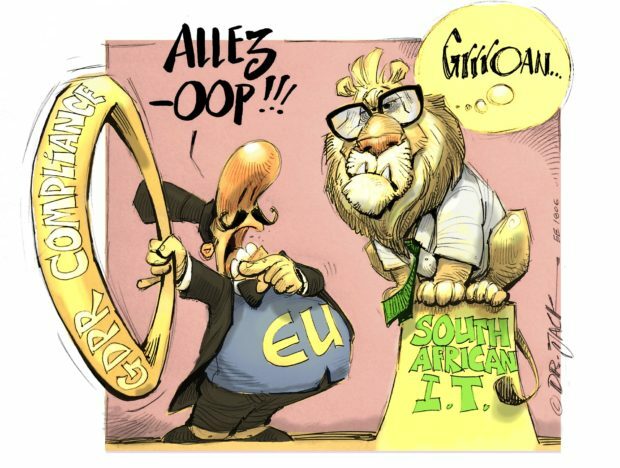 Africa is out of step with global developments in the provision of electricity for its citizens. Sub-Saharan Africa is reported as the least likely to develop or keep pace with global efforts in the next 20 years. The developing nations are marked and noted for their research and development (R&D) investments as a percentage of GDP. South Africa is the only represented African country on the map of R&D investment but its connectivity compares fairly with northern African nations such as Morocco, Algeria and others. Sandia’s Ideal Future of Energy Storage Solutions (ESS) is anchored in a triad of research and development, technology and systems applications, and demonstration deployment/installations with appropriate controls. South Africa’s accelerated uptake and introduction of ESS could customise the Sandia approach to local conditions. The South African Energy Storage Research Development and Innovation activities are led by the Department of Science and Technology (DST) with the following participants: Council for Scientific and Industrial Research (CSIR), University of Western Cape (UWC), University of Limpopo (UL), Nuclear Energy Council of South Africa (Necsa), Nelson Mandela University (NMU) and Mintek. The materials activities cover the value chain from precursor developments, through the synthesis and assembly of battery packs to their recycling. The aimed applications are for renewables coupling mainly with solar and wind, as well as grid and other niche mobile and portable technologies. Fig. 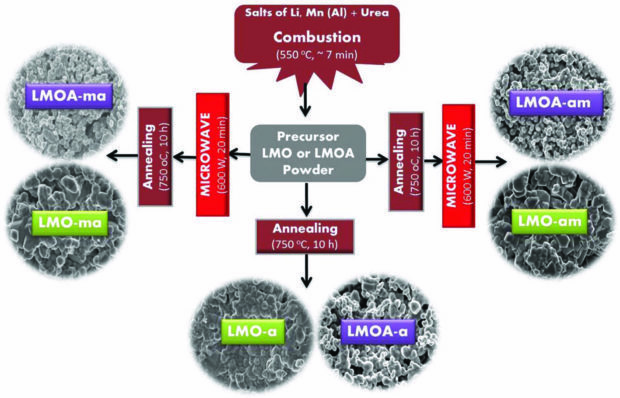 1: Schematic representation of the microwave-assisted combustion synthesis of LiMn2O4 (LMO) and LiMn1.7Al0.3O4 (LMOA) . Rechargeable Li-ion batteries (RLIBs) have proved themselves as the most attractive advanced battery technologies for electric vehicles and portable electronic devices such as cellphones, digital cameras and laptops. Spinel LiMn2O4 (LMO) discovered at the CSIR in the 1980s by Thackeray and co-workers, is one of the most promising cathode materials for RLIBs due to its high operating voltage (4 V), low cost, environmental compatibility, and stability at low temperature compared to other cathode materials [1, 2]. As a result, this cathode material has been used in electric vehicles such as the Nissan Leaf (a pure electric vehicle) and Chevrolet Volt (a plug-in hybrid electric vehicle). However, its full utilisation is hampered by the loss of capacity upon charging and discharging many times. This loss of capacity upon cycling (capacity fade) results in poor cycle performance. Microwave irradiation at the pre- and post-annealing steps of the synthesis of spinel LiAlxMnx-2O4 (x = 0 and 0,3) cathode materials has been reported as a useful strategy to improve the performance of RLIBs . The strategy impacts on the morphology, crystal structure and average manganese valence [3-7]. These then result in enhanced capacity, capacity retention and reversibility of the deintercalation/ intercalation processes upon continuous cycling. Fig. 2: Electrochemical performance of prestine Na 0,67 Mg 0,28 Mn 0,7 2O2-xFx (NaMgMnO-a), microwave irradiated (NaMgMnO-ma), fluorine-doped (NaMgMnO-af) and fluorine- doped microwave irradiated (NaMgMnO-maf) . However, the extensive use of RLIBs in portable electronic devices and electric vehicles will eventually increase the demand of RLIBs. Sodium-ion batteries (SIBs) are one of the best alternatives for RLIBs for smart grid applications [8-10]. This is because SIBs have high energy density, long cycle life and cheap as sodium is the fourth most abundant element in the earth’s crust and is uniformly distributed around the world [11, 12]. 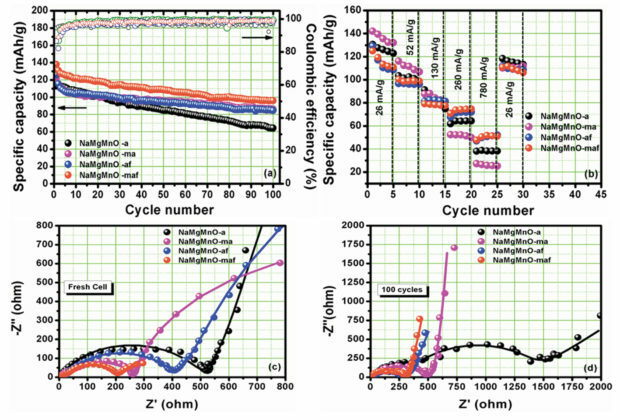 Manganese based cathode materials for SIBs also exhibit capacity fade upon cycling. The effect of microwave irradiation was also reported for a P2-type Na 0,67 Mg 0, 28 Mn 0,7 2O2-xFx (x = 0 and 0,02) based cathode materials for sodium-ion batteries . The microwave irradiation and fluorination improved the capacity, coulombic efficiency, capacity retention, cycling performance and impedance. The work reported above is based on half-cell studies and to test the performance of these materials in near application conditions, full cell and pouch cell studies are on-going. This is because the performance of the cathode material differs in different cell configurations. Hydrogen storage is an important component in the hydrogen energy value chain and plays a key role in the advancement of hydrogen and fuel cell technologies for various applications. The storage of hydrogen is one of the key bottlenecks that have delayed the actualisation of a hydrogen economy. A key consideration for our MOF-based materials research is a special focus on promoting beneficiation of South African resources as the materials incorporate indigenous metals such as zirconium and chromium and PGMs. Locally available unconventional feedstocks are also being explored for their production. Fig. 3: Examples of MOFs developed at the CSIR-HySA infrastructure. Fig. 4: MOFs shaping strategies being developed at the CSIR-HySA infrastructure, i.e. granulation, electrospinning and polymer/MOF aerogels. Some examples of MOFs developed at the CSIR-HySA infrastructure together with shaping strategy is presented in Figs. 3 and 4. Progress on the development of a technical demo for H2 storage goes hand-in-hand with our in-house development of high pressure composite cylinder that will contain the MOFs materials with the goal of achieving relatively lower pressure and lightweight storage. Composite cylinders allow the storage of gas at high pressure in a lightweight tank, which is particularly beneficial for vehicle applications. At the moment the production of composite cylinders in South Africa is non‐existent, and this presents a unique opportunity for our research interests. Our high pressure composite cylinders consist of liner overwrapped with a composite of glass or carbon fibre in an epoxy matrix. Our work aims to develop a better matrix in terms of strength and that also possesses a matrix that could withstand thermally detrimental conditions. Then produce samples of this material for testing and produce full high pressure cylinders. This will enable us to be the first in South Africa to produce these cylinders locally. Atomic layer deposition (ALD) is used in the synthesis of thin films for fields such as semiconductors for PV applications, battery cathodes materials and fuel cell electrocatalysts among others. ALD can be a physical or an electrochemical process. The electrochemical atomic layer deposition known as EC-ALD was pioneered by Stickney and co-workers, and then referred to as ECALE, i.e. electrochemical atomic layer epitaxy . EC-ALD continues to be used in the synthesis of electrocatalysts and other materials. A schematic representation of the EC-ALD strategy is presented in Fig. 6 with the formation of CdS. Fig. 5: Wound prototypes cylinders developed at CSIR-HySA infrastructure. Pressure testing still needs to be undertaken. 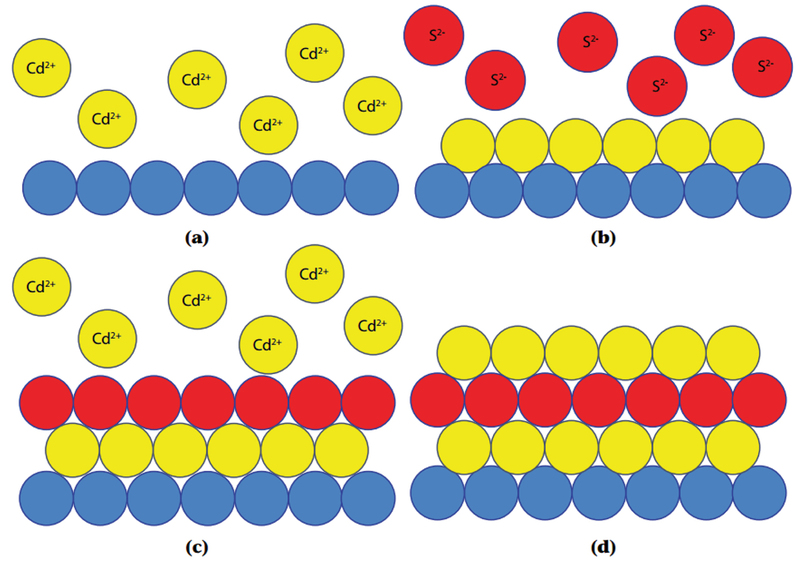 EC-ALD as presented above depicts a sequential elemental deposition in the formation of a CdS thin film semiconductor compound . EC-ALD reactions are surface limited reactions that use underpotential deposition (UPD) potential for the selection of deposition potential to be used in the deposition programme. The substrate play an important role is the successful deposition of any formed systems. The advantages of EC-ALD which make it attractive are that it is a room temperature, low cost process which allows for a controlled film thickness of an ordered deposition. Deposition parameters such as pH, potential, concentration, time and electrolyte can in the process be individually optimised for elements to be deposited. Electrocatalysts are important in fuel cells as their loading impacts on the costs of these fuel cells. Various combinations of electrocatalysts from bimetallic to trimetallic systems have been grown on different carbon derived subtrates like glassy carbon and lately the carbon paper. The characterization techniques are used to study the physico-chemical properties of such electroctalysts to determine their suitability to be used in oxygen reduction reactions (ORR). Certain systems like PdPt electrocatalyst have been shown to be difficult to synthesize without the aid of a sacrificial element. The Stickney group and others introduced the concept of surface-limited redox replacement reactions (SLRR) which showed that for conformal epitaxial growth, a copper (Cu) sacrificial layer was useful in ensuring that subsequent layer are able to grow on the substrate without peeling. Fig. 6: Scheme for CdS EC-ALD cycle . The PdPt bimetallic electrocatalyst grown on a carbon paper substrate will be used as an example to show it performance in ORR . Pd, Pt and PdPt on carbon paper were prepared using E-ALD, an image of 24PdPt/C paper shows clustured evenly distributed Pd and Pt particles on carbon paper as shown in Fig. 7, and other prepared electrocatalysts are listed in Table 1. The prepared catalysts were found to be electrochemically active using cyclic voltammetry studies. The ORR activity in terms of the onset potential and limiting current was enhanced on the bimetallic electrocatalysts when compared to the monometallic Pt/C paper and Pd/C paper as summarised in Table 1. ORR performance increased with the number of PdPt deposition cycle. 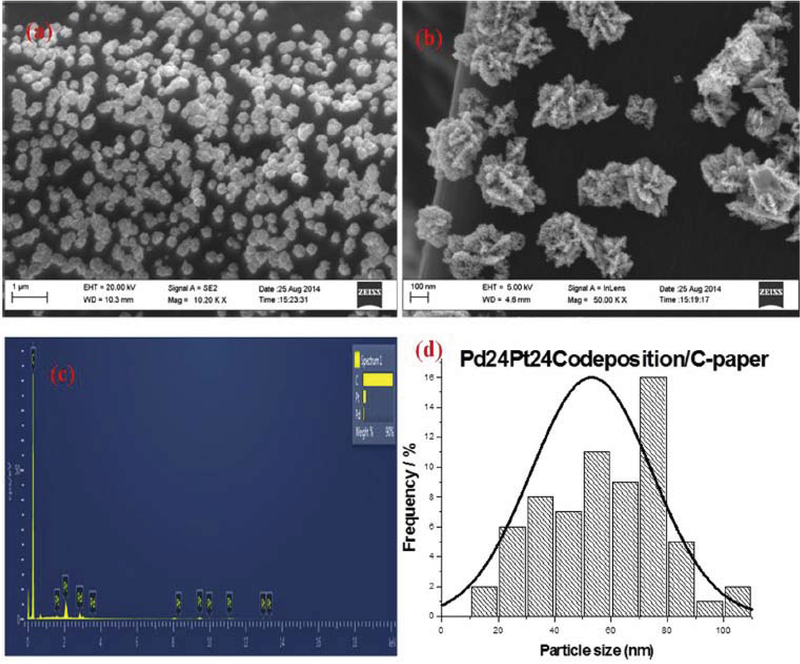 Pd24Pt24/C paper electrode showed a more positive onset potential of 0,701 V, higher limiting current and lower overpotential than the other catalysts. ORR catalyst for direct alcohol fuel cells needs to be tolerant to alcohols, the prepared electrocatalysts were tested. Methanol tolerance results for the best 3 performing electrodes summarised in Table 1. The other prepared electrocatalysts were highly affected by the presence of methanol. The smaller the onset voltage difference between the LSV profile without and with methanol implies that the electrode is less affected by the crossed over methanol. Low voltage difference of 28 mV was obtained on 24PdPt/C paper co-deposition, when compared to that of 56 mV for commercial Pt/C confirms the importance of using Pd together with Pt as cathode material for DMFC as reported in literature [18-20]. Fig. 7: HRSEM images for 24PdPt/C paper co-deposited at low (a) and high magnification (b), the EDS profile (c) and particle size histogram (d). The findings on the use of microwave irradiation in the preparation of manganese-based cathode materials promise to revolutionise how microwave irradiation is used in the preparation of energy materials for enhanced performance. Our contributions in the development of practical and low‐cost MOF‐based hydrogen storage materials and composite cylinders will play a key role in resolving the energy storage challenge as an integral part of the hydrogen economy. Table 1: The ORR activity in terms of the onset potential and limiting current. M Thackeray, W David, P Bruce, J Goodenough: “Lithium insertion into manganese spinels”, Materials Research Bulletin, 18, 4, 461-472, April 1983. R Gummow, A De Kock, M Thackeray: “Improved capacity retention in rechargeable 4 V lithium/lithium-manganese oxide (spinel) cells”, Solid State Ionics, 69, 1, 59-67, April 1994. FP Nkosi, CJ Jafta, M Kebede, L le Roux, MK Mathe, KI Ozoemena: “Microwave-assisted optimization of the manganese redox states for enhanced capacity and capacity retention of LiAlxMn2−xO4 (x = 0 and 0.3) spinel materials” RSC Advances, 5,41, 32256-32262, March 2015. CJ Jafta, MK Mathe, N Manyala, WD Roos, KI Ozoemena: “Microwave-Assisted Synthesis of High-Voltage Nanostructured LiMn1.5Ni0.5O4 Spinel: Tuning the Mn3+ Content and Electrochemical Performance”, ACS applied materials & interfaces, 5, 15, 7592-7598, July 2013. CJ Jafta, K Raju, MK Mathe, N Manyala, KI Ozoemena: “Microwave Irradiation Controls the Manganese Oxidation States of Nanostructured (Li[Li0.2Mn0.52Ni0.13Co0.13Al0.02]O2) Layered Cathode Materials for High-Performance Lithium Ion Batteries “Journal of the Electrochemical Society, 162,4, A768-A773, February 2015. FP Nkosi, K Raju, N Palaniyandy, M Reddy, C Billing, KI Ozoemena: “Insights into the Synergistic Roles of Microwave and Fluorination Treatments towards Enhancing the Cycling Stability of P2-Type Na0.67[Mg0.28Mn0.72]O2 Cathode Material for Sodium-Ion Batteries” Journal of the Electrochemical Society, 164,13, A3362-A3370, November, 2017. K Raju, FP Nkosi, E Viswanathan, MK Mathe, K Damodaran, KI Ozoemena:”Microwave-enhanced electrochemical cycling performance of the LiNi0.2Mn1.8O4 spinel cathode material at elevated temperature” Physical Chemistry Chemical Physics, 18, 13074-13083, April, 2016. N Yabuuchi, K Kubota, M Dahbi, S Komaba: “Research Development on Sodium-Ion Batteries” Chemical reviews, 114,23, 11636-11682, November 2014. BL Ellis, LF Nazar,”Sodium and sodium-ion energy storage batteries”, Current Opinion in Solid State and Materials Science, 16,4, 168-177, August 2012. V Palomares, P Serras, I Villaluenga, KB Hueso, J Carretero-González, T Rojo: “Na-ion batteries, recent advances and present challenges to become low cost energy storage systems” Energy & Environmental Science, 5,3, 5884-5901, February 2012. H Pan, Y Hu, L Chen: “Room-temperature stationary sodium-ion batteries for large-scale electric energy storage”, Energy & Environmental Science, 6, 2338-2360, June 2013. DP Broom, CJ Webb, KE Hurst, PA Parilla, T Gennett, CM Brown, R Zacharia, E Tylianakis, E Klontzas, GE Froudakis, Th A Steriotis, PN Trikalitis, DL Anton, B Hardy, D Tamburello, C Corgnale, BA van Hassel, D Cossement, R Chahine, M Hirscher : “Outlook and challenges for hydrogen storage in nanoporous materials”. Applied Physcs. A, 122, 151, February 2016. J Ren, X Dyosiba, NM Musyoka, HW Langmi, M Mathe, S Liao: “Review on the current practices and efforts towards pilot-scale production of metal-organic frameworks (MOFs)”. Coordination Chemistry Reviews, 352, 187-219, September 2017. BW Gregory and JL Stickney: “Electrochemical atomic layer epitaxy (ECALE)”. Journal of Electroanalytical Chemistry and Interfacial Chemistry, 1, 300, 543-561, February 1991. JL Stickney: “Atomic layer deposition by electrochemistry”, The Electrochemical Society Interface, 20, 2, 28-30, June 2001. RG Motsoeneng, RM Modibedi, MK Mathe , LE Khotseng, KI Ozoemena: “The synthesis of PdPt/carbon paper via surface limited redox replacement reactions for oxygen reduction reaction”, International Journal of Hydrogen Energy 40, 16734-16744, December 2015. JJ Shi, GH Yang, JJ Zhu: “Sonoelectrochemical fabrication of PDDA-RGO-PdPt nanocomposites as electrocatalysts for DAFCs”. Journal of. Material Chemistry;21,7343-7349, April 2011. KG Nishanth, P Sridhar, S Pitchumani, AK Shukla: “A DMFC with methanol-tolerant-carbon-supported Pt-Pd alloy cathode”. Journal of Electrochemical Society;158, 871-876, June 2011. X Li, Y Zhu, Z Zou, M Zhao, Z Li, Q Zhou: “Simple complexing-reduction sysnthesis of Pd-Pt/C alloy electrocatalysts for oxygen reduction reaction”. Journal of Electrochemical Society; 156, 1107-1111, July 2009.